Australia's greatest ancient Aboriginal rock art detailing kangaroos, turtles and humans on boulders in the remote Pilbara area will be studied under a US$1.1 million deal announced Monday. Tens of thousands of the indigenous works, which are scattered over the mineral-laden region, will be researched and catalogued under a six-year agreement between the University of Western Australia and miner Rio Tinto. Although one of the world's richest collections of Aboriginal art, the carvings which lie on the National Heritage-listed Dampier Archipelago, about 1,500 kilometers (930 miles) north of Perth, have never been fully documented. "It's surprising that we don't know what is there but that is very much the case for everywhere in Australia, everywhere that we have rock art," said Australian rock art expert Jo McDonald. "The Sydney region is a very good example of that. We've probably only documented about 25 percent of the engravings in Sydney 200-plus years later. "It's a very time consuming process and there's a lot of it." 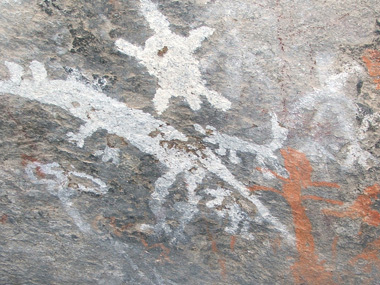 The rock art in Western Australia's Pilbara is thousands of years old and includes images of thylacines, the "Tasmanian tigers" which became extinct on the Australian mainland an estimated 3,500 years ago. Among the most significant panels are those showing human faces and activities and what some experts believe are mythical figures. Also amidst the boulders on the Burrup peninsula of the Pilbara, one of the country's major industrial hubs for resources, are archaic faces which McDonald said could be among some of the earliest documented images of humans. "The Burrup includes some of what we think is the earliest art in Australia," said McDonald, who will become the first Rio Tinto Chair of Rock Art Studies at the University of Western Australia. "It also records the changing climate." "The sea level rose to where it is now about 7,000 years ago and a lot of the art there has been produced after that time, so we've pictures of turtles and fish and sharks and other marine animals that obviously record that phase," McDonald said. The government placed the Burrup rock art on the National Heritage List in mid-2007 but campaigners fear that threats to it have intensified in recent years as mining and energy companies drain the region of iron ore, natural gas and other resources to feed the huge demand from Asia.